"This book wil tell you about a long time gone prodigal who has been brought back . . . You'll find out how I've fallend and how I've turned around again to feel (God's) love and His forgiveness . . . . You have my promise that I will unveil my life just as clearly and honestly as I know how. I'm including the failures as well as the times spent in finding strength," states Johnny Cash in the opening paragraphs of his new book, "Man in Black". So many facts have come down in exaggerated form or out of context, and now this man who has become a legend in his time gives you his own story in his own words! STarting with his childhood years and on into the country and western music circuit, through the seven long years of drug addiction to the living faith he now experiences, this is the real Johnny Cash. "As far as fleeting fame and earthly glories I had hit the top, I'd been to Carnegie Hall, the Hollywood Bowl, and on the cover of "Look" magazine. . . . (but) sometimes when I'm alone and I sing "My Prayer" again, that's when I feel higher and better than any time I've ever been on stage, because its . . . a reminder every time I sing it that God does answer prayer." 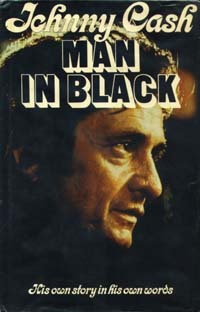 The lessons shared are deeply personal and humbling, as Johnny Cash tells his life story in "Man In Black". This book gives the reader an in-depth look at the pressures and problems inherent in show-business life, and reveals how a solid faith makes it possible to live serenely in the vortex of a sometimes chaotic whirl.